AnimeWorks is proud to bring to NTU two screening sessions of the revamped classic anime hit, Rebuild of Evangelion, as part of our semesterly Animation Revelation screening event! The screening is free and open to all members of the NTUVAS! Membership can be applied for at the door. Free Refreshments provided! Please register using the contact details as provided in the above poster. The Rebuild of Evangelion is a tetralogy of animated films that is a remake of the acclaimed anime series Neon Genesis Evangelion which was released back in 1995. Both of the first two films have been well-received by both fans and audiences alike, having won several awards including Anime of the Year at the 2008 Tokyo International Anime Fair, Theatrical film award at the 13th Animation Kobe Awards and first place in the Animation category of the 2009 French Lyon Asian Film Festival. If you have watched the original series before, expect new scenes, characters, settings and updated graphics; these will be the two films that you DEFINITELY can’t miss! So why wait? 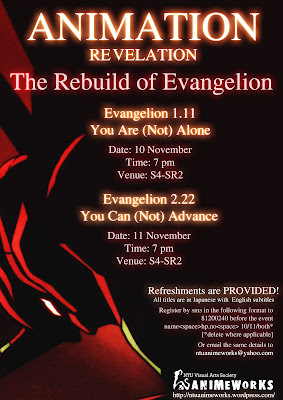 Register by e-mailing (your Name/ Contact Number/ Dates Attending) to ntuanimeworks@yahoo.com NOW! All movies will be in their original Japanese language with English subtitles.